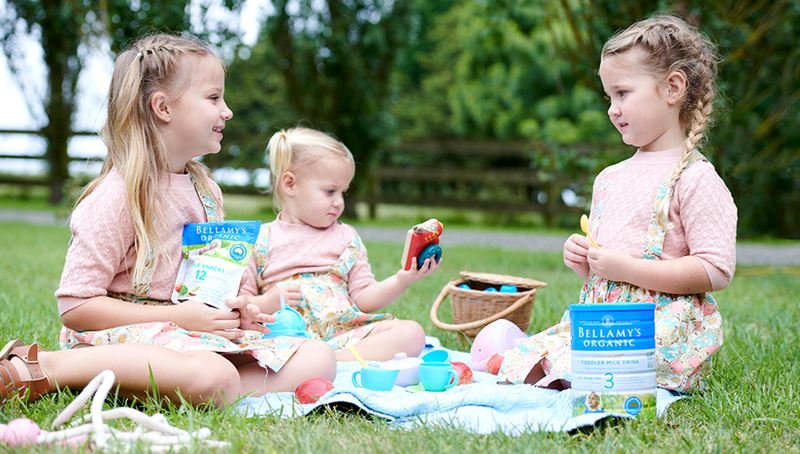 Bellamy’s Organic Step 3 Toddler Milk Drink is a premium formulated supplementary milk drink, carefully crafted to support active toddlers from 1 to 3 years of age, when dietary intake may be inadequate. An enriched alternative to ordinary cow’s milk, our Toddler Milk Drink is made from certified organic cow’s milk, with the addition of essential fatty acid DHA, prebiotic (GOS) and 16 essential vitamins and minerals. Our Toddler Milk Drink tin will provide you with the necessary measuring scoop and preparation instructions, along with a feeding table to guide you on how much your toddler will need each day. % RDI = % Recommended Daily Intake for children aged 1 to 3 years. 1 scoop = 8.6 g of powder. Your toddler may need more or less than indicated. IMPORTANT NOTICE: OUR ORGANIC TODDLER MILK DRINK IS A FORMULATED SUPPLEMENTARY DRINK FOR YOUNG CHILDREN. IT IS DESIGNED TO COMPLEMENT THE DIETARY NEEDS OF TODDLERS WHO MAY REQUIRE ADDITIONAL INTAKES OF ENERGY AND NUTRIENTS. Wash and rinse cup or bottle and all utensils thoroughly. Add 4 level scoops (34.4 g) of Organic Toddler Milk Drink to 200 mL of drinking water.